The Charles Laughton pages ... The Gas Centre. This is a Diagrammatical Plan (Fig.1) as found in the War Diary of the 73rd Field Ambulance (Reference WO 95/2202 at the National Archives, Kew) The 73rd Field Ambulance was the medical unit behind the 73rd Brigade (which comprised the 9th Royal Sussex, 7th Northamptonshires and 13th Middlesex). 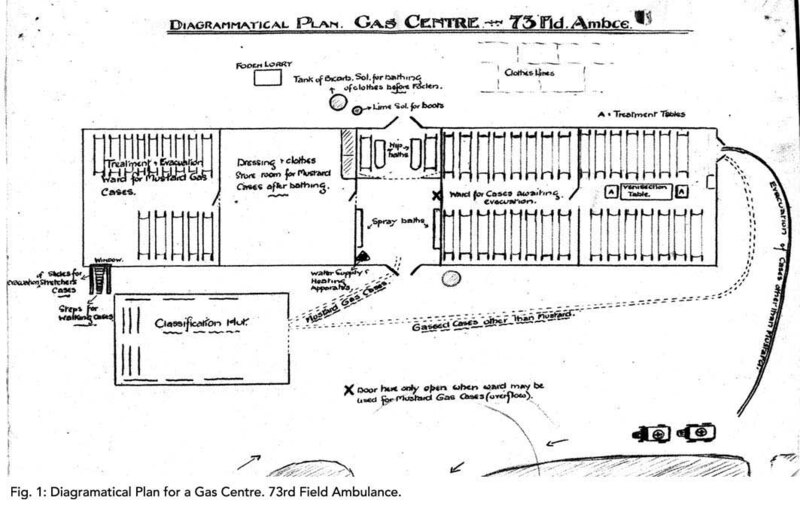 The drawing describes how to organize a centre to deal with gas casualties. In Fig. 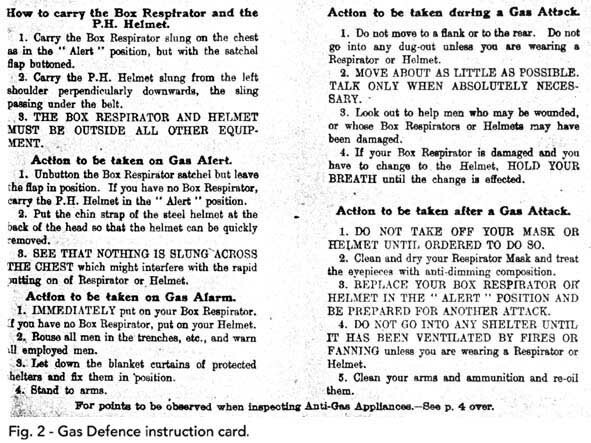 2 you can see a Gas Defence instruction card as issued to British soldiers, containing instructions about how to proceed in the event of a gas attack. Men reaching the gas centre were separated in two groups: those affected by mustard gas and those by other gases, which had to be evacuated to other treatment centres (That is, as far as any treatment could be done at all). Mustard gas was not necessarily lethal, but certainly very disabling, and very hurtful. Its effects on the eyes varied from irritation in slight doses to total blindness in larger ones. A small dose would cause a sore throat, but a greater dose could destroy the lungs. It burnt and blistered the skin in contact with the gas, especially where the skin was moist (i.e. : with sweat). Clothes impregnated had to be removed and those affected had to be bathed to prevent further damage to the skin, and then be provided with clean clothing. Masks could protect against its effects on eyes and breathing apparatus, but there was no protection for the rest of the body. The less dangerous were Tear Gas, which only affected the eyes and in the worst of cases caused temporary blindness, and Blue Cross, which would irritate the eyes and throat. Even though they were not lethal, these gases could be used in combination with others more dangerous and those who took off their masks believing that the danger was small would then expose themselves to other types of poisonous gases. More dangerous, indeed lethal, were Chlorine (asphyxiant gas), which destroyed the lungs, and Phosgene, which had a delayed action and attacked the blood, lungs and heart. Those badly affected by them were often beyond treatment. Here you have some links connecting with external with the effects of Gas Warfare, whether articles or images. Warning: bear in mind that the articles have illustrations depicting the effects of different poisonous gases which are not nice to see. Most of these links contain a good number of references to printed sources dealing with the matter, as well as further related articles and images I must thank Mr. Geoffrey Miller (editor of the "Medical Aspects of gas Warfare") and Michael D'Alessandro (from "the Virtual Naval Hospital"). Mr. Rob Ruggenberg (from "The Great War heritage"), Ms. Natasha Wallace (from jssgallery.org), Mr. Howard Anderson (of the Western front Association Website), Michael Duffy (from firstworldwar.com), A. Langley (from "Great War and different" website), the BBC History Website.......ETC for allowing us to link to their most informative websites. Our thanks also to the National Archives (Kew, London) and the Library and Archives Canada. • You can read here a general article about the use of chemical weapons during First World War. • Sadly, the use chemical weapons didn't end with the First World War. Not only that, chemical weapons of Great War vintage remain a present danger: to this day, unexploded shells are still being recovered from the old battlefields. • For a medical view of the effects of chemical weapons, you can get further information in this website dealing with The Medical Aspects of Gas Warfare , and you can also access to the PDF files the Virtual Naval Hospital had on this issue. • Here you can see a photo of British soldiers blinded by gas. 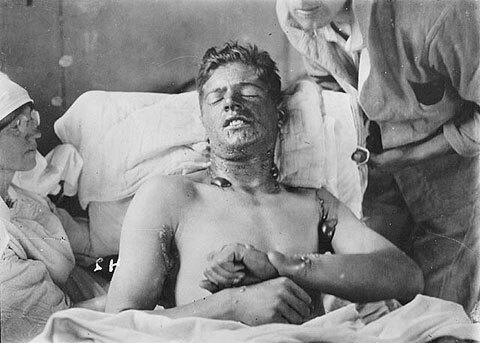 • You can see here an American soldier affected by mustard gas. • Painter John Singer Sargent was appointed official War Artist during the Great war. One of his better known paintings of that period is "Gassed", Which you can see here, along with preliminary sketches and accompanied by Wilfrid Owen's poem "Dulce et decorum", which describes the effects of poison gas. You can read an article about that painting here. "Chemical Soldiers: British Gas Warfare in World War I" by Donald Richter. University Press of Kansas, 1992. "Men of 18 in 1918" by Frederic James Hodges. Hodges' autobiographical book gives a good account of his duties as a young Gas NCO in the last year of the war. Published by Arthur H. Stockwell Ltd. Elms Court, Ilfracombe, Devon, 1986. The data on this page has very kindly been provided by Gloria Porta - many thanks to her and to all those mentioned for permission to use their information and research. Where possible all credit has been given to them and the original source quoted.